Acting like you’re strung out on heroin isn’t really on a lot of coordinators’ list of desirable traits. 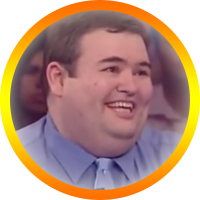 Josh Eldridge lugged himself around the East Coast to get on Who Wants to be a Millionaire. He flew from his home in Tazewell, TN to New York City to try out for the show, then immediately took a train to Philadelphia, PA, to partake in the 3rd Annual 24-Hour Game Show Marathon. Once the show called him back and said he’d be on, he drove to Stamford, CT to be on the show before walking away over $60,000 richer. Josh shares with me what he said and did to get on the show and win the show’s ultimate prize—a bear hug from Terry Crews. “First bit of advice: get a good night sleep the night before, give yourself plenty of time to get to the venue. It sounds funny for something as exciting and fun as a game show audition, but treat it like a job interview. But only slightly not as serious,” he tells me. Josh’s first audition was a local audition in Nashville, for WWTBAM’s 10th Anniversary special, hosted by Regis Philbin. “I basically left at 9:30pm the night before to get there for the 7:30 am session. Totally wasn’t on my a-game for that one, surprisingly enough. [I] didn’t get any sleep, so I made a piss-poor first impression when it came to the face-to-face interview. Acting like you’re strung out on heroin isn’t really on a lot of coordinators’ list of desirable traits,” Josh tells me with a wink. Every audition I went to before this—and I’ve tried out for a few—I went into it with a make-or-break attitude, but this time I didn’t. I can speak to Josh’s success during his interview, because he asked me to be his Plus One when he made it on the show in 2014. Backstage, the producer who was responsible for casting him continually raving on how funny and charming he was. That wasn’t an accident. It’s the Instagram method—you’re there to give them a snapshot of your life. Put an interesting filter on it. Don’t force it, don’t act excited, be excited. These are people who are paid to spot and weed out phonies.